Battle casualties among the airborne troops were light, totaling nineteen. Jump casualties were higher- eight-four- but almost half of these returned to duty immediately after treatment. Included in the reminder sent by the joint Chiefs on 24 March (received in Tokyo on the 25th) were orders that MacArthur report to them for instructions should his counterpart respond to his offer and "request an armistice in the field." No such response was expected, however, and since Truman had canceled his own cease-fire initiative, operations in strength above the 38th parallel again had become a tactical question for General MacArthur and General Ridgway to answer. MacArthur, in fact, publicly revealed his answer before he really knew that the diplomatic effort to achieve a cease-fire had been canceled. Upon his return to Tokyo late on 24 March following his conference with Ridgway and a visit to the front, he announced that he had directed the Eighth Army to cross the parallel "if and when its security makes it tactically advisable.48 More specifically than that, of course, MacArthur had approved Ridgway's concept of a general advance as deep as twenty miles into North Korea. Alluding to past and recent proposals of cease-fire negotiations, Ridgway also advised that future governmental decisions might compel the Eighth Army to adopt a static defense. Because of its inherent rigidity, such a stance would require strong leadership and imaginative tactical thinking, he warned, to stand off a numerically stronger enemy that might not be similarly inhibited in the choice of tactics. He planned now to point his main attack toward the centrally located road and rail complex marked out by the towns of P'yonggang in the north and Ch'orwon and Kumhwa in the south. This complex, eventually named the Iron Triangle by newsmen searching for a dramatic term, lay twenty to thirty miles above the 38th parallel in the diagonal corridor dividing the Taebaek Mountains into northern and southern ranges and containing the major road and rail links between the port of Wonsan in the northeast and Seoul in the southwest. Other routes emanating from the triangle of towns connected with Pyongyang to the northwest and with the western and eastern halves of the present front. A unique center of communications, the complex was of obvious importance to the ability of the enemy high command to move troops and supplies within the forward areas and to coordinate operations laterally. 1 Rad, GX-3-3813 KGOO, CG Eighth Army to CG I Corps et al., 21 Mar 51. 2 Rads, GX-3-3900 KGOO, GX-3-3908 KGOO, and GX-3-4040 KGOO, CG Eighth Army to CG I Corps et al., first two 21 Mar and last 22 Mar 51; Eighth Army Comd Rpt, Nar, Mar 51; Eighth Army CG SS Rpt, Mar 51. 3 Rads, GX-3-3813 KGOO, GX-3-4040 KGOO, and GX-3-4149 KGOO, CG Eighth Army to CG I Corps et al., first one 21 Mar and last two, 22 Mar 51. 4 I Corps Opn Dir 50, 21 Mar 51; 1 Corps Comd Rpt, Nar, Mar 51; Eighth Army Comd Rpt, Nar, Mar 51. 5 I Corps Opn Dir 51, 22 Mar 51; I Corps Comd Rpt, Nar, Mar 51; Eighth Army Study, Task Force Growdon, in CMH. 6 Colonel Mudgett replaced Dabney, now a briga dier general, on 21 March 1951. 7 Eighth Army CG SS Rpt, Mar 51; Eighth Army G3 Jul, Sum, 21 Mar 51; Eighth Army Comd Rpt, Nar, Mar 51; Rad, GX-3-4097 KGOO, CG Eighth Army to CG I Corps et al., 22 Mar 51. 8 Rad, GX-3-4040 KGOO, CG Eighth Army to CG I Corps et al., 22 Mar 51; Rad, CIACT 3-30, CG I Corps to CO 6th Med Tk Bn, 23 Mar 51; 1 Corps Opn Dir 52, 23 Mar 51. 9 I Corps Comd Rpt, Nar, Mar 51; Eighth Army Study, Task Force Growdon. 10 The provisional Combat Cargo Command had been discontinued and the 315th Air Division activated to replace it on 25 January 1951. Brig. Gen. John P. Henebry had replaced General Tunner as commander of the 315th on 8 February 1951. 11 Eighth Army Study, Operation Tomahawk, in CMH; 187th Abn RCT Comd Rpt, Nar, Mar 51; Futrell; The United States Air Force in Korea, pp. 353-55. 12 Accompanying the 187th to provide additional medical support was a para-surgical team from the Indian 60th Field Ambulance and Surgical Company. 13 187th Abn RCT Opn O 2, 22 Mar 51; 187th Abn RCT Comd Rpt, Nar, Mar 51; Eighth Army Study, Operation Tomahawk. 14 187th Abn RCT Comd Rpt, Nar, Mar 51; Eighth Army CG SS Rpt, Mar 51; Eighth Army Study, Operation Tomahawk. 15 187th Abn RCT Comd Rpt, Nar, Mar 51; Eighth Army Study, Operation Tomahawk; I Corps POR 576, 23 Mar 51. 16 Eighth Army Study, Operation Tomahawk. 17 Rad, GX (TAC) 124 KCG, CG Eighth Army to CINCFE, 23 Mar 51; Eighth Army Study, Operation Tomahawk. 18 I Corps Comd Rpt, Nar, Mar 51; Eighth Army Study, Task Force Growdon. 19 I Corps Opn Dir 52, 23 Mar 51; Eighth Army Study, Operation Tomahawk; ibid., Task Force Growdon. 20 I Corps POR 576, 23 Mar 51; Eighth Army G3 Consolidated Opn Rpt, 24 Mar 51; Rad, CIACT 3-35, CG I Corps to CG 1st ROK Div, 24 Mar 51; I Corps Comd, Rpt, Nar, Mar 51. 21 I Corps Comd Rpt, Nar, Mar 51; 25th Div Comd Rpt, Nar, Mar 51. 22 1 Corps G3 Jnl, 23 Mar 51; 3d Div G3 Jnl, 23 Mar 51; 3d Div Comd Rpt, Nar, Mar 51. 23 3d Div Comd Rpt, Nar, Mar 51. 24 Rad, CIACT 3-37, CG I Corps to CG 1st ROK Div et al., 24 Mar 51; 187th Abn RCT S3 Jnl, 24 Mar 51, and Comd Rpt, Nar, Mar 51. 25 187th Abn RCT S3 Jul, 24 Mar 51, and Comd Rpt, Nar, Mar 51; Eighth Army Study, Task Force Growdon. 26 187th Abn RCT Comd Rpt, Nar, Mar 51; Eighth Army Study, Task Force Growdon. 27 187th Alm RCT S3 Jnl, 25 Mar 51; Eighth Army Study, Operation Tomahawk. 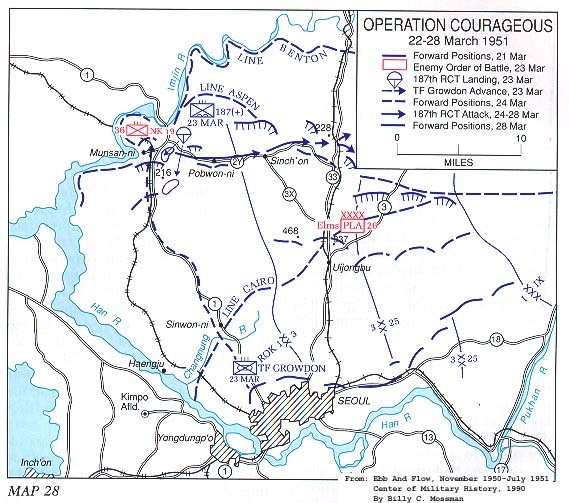 28 Eighth Army G3 Consol Opn Rpt, 25 Mar 51; I Corps Comd Rpt, Nar, Mar 51; 3d Div Comd Rpt, Nar, Mar 51. 29 On the 26th General Soule reported to General Ridgway that one of his tanks had knocked out a T34. This piece was the first enemy armor destroyed by ground action since Ridgway had taken command of the Eighth Army. The T34 may have belonged to the 17th Mechanized Division of the North Korean I Corps. See Eighth Army CG SS Rpt, Nar, Mar 51. 30 187th Abn RCT Comd Rpt, Nar, Mar 51; 3d Div Comd Rpt, Nar, Mar 51. 31 3d Div Comd Rpt, Nar, Mar 51; 25th Div Comd Rpt, Nar, Mar 51. 32 Rad, GX-3-4877 KGOO, CG Eighth Army to CGs I and IX Corps, 26 Mar 51; Eighth Army Comd Rpt, Nar, Mar 51. 33 Rad, GX-3-4228 KGOO, CG Eighth Army to CG I Corps et al., 23 Mar 51; Rad, GX (TAC) 128 KCG, CG Eighth Army to C/S ROKA et al., 24 Mar 51. 34 Eighth Army Comd Rpt, Nar, Mar 51; Eighth Army G3 and G2 SS Rpts, Mar 51. 35 Collins, War in Peacetime, p. 266; Truman Years of Trial and Hope, p. 440; Acheson, Present at the Creation, pp. 517-18; Schnabel, Policy and Direction, pp. 357-58. 36 Collins, War in Peacetime, pp. 263-66; Acheson, Present at the Creation, p. 517; Rees, Korea: The Limited War, p. 208. 37 Rad, JCS 86276, JCS to CINCFE, 20 Mar 51. 38 The Tokyo dateline of MacArthur's letter was 20 March. Since Tokyo time is fourteen hours ahead of Washington time, MacArthur presumably wrote his letter before the joint Chiefs of Staff prepared their message of the same date. 39 Both letters are quoted in MacArthur, Reminiscences, pp. 385-86. 40 Rad, C 58203, CINCUNC to DA for JCS, 21 Mar 51. 41 Schnabel, Policy and Direction, pp. 358-60; Rad, C 58292, MacArthur for Ridgway, 22 Mar 51. 42 Rad, G-3-4122 KCG, CG Eighth Army to CINCFE, 22 Mar 51; Rad MacArthur to Ridgway, 23 Mar 51; Eighth Army CG SS Rpt, Mar 51. 43 To this extent, MacArthur's action was in accord with earlier advice a Department of State official gave the Department of Defense shortly after the Inch'on landing: "A cease-fire should be a purely military matter and . . . the Commanding General of the unified command . . . is the appropriate representative to negotiate any armistice or cease-fire agreement." See Schnabel, Policy and Direction, p. 359. 44 MacArthur, Reminiscences, pp. 387-88; Truman, Years of Trial and Hope, pp. 440-42. 45 Ltr, Truman to George M. Elsey, 16 Apr 51, quoted in D. Clayton James, The Years of MacArthur, vol. III, Triumph and Disaster, 1945-1964 (Boston: Houghton Mifflin Co., 1985), p. 588. 46 Truman, Years of Trial and Hope, pp. 441-12. 47 Ibid., pp. 442-43. When asked some years later why he did not relieve MacArthur at the time, Truman replied that he wanted a "better example of his insubordination, and I wanted it to be one . . . that everybody would recognize for exactly what it was, and I knew that, MacArthur being the kind of man he was, I wouldn't have long to wait." See Merle Miller, Plain Speaking (New York: Berkley Publishing Corp., 1973), pp. 302-03. 48 Collins, War in Peacetime, pp. 270-71; Ridgway, The Korean War, p. 116; copy of MacArthur's 24 March statement with Ridgway papers in CMH. 49 Discussion of the conference is based on MS, Ridgway, The Korean War, Issues and Policies, pp. 405, 407-10; Ridgway, The Korean War, pp. 121-23, 157. 50 The conference had a tragic postscript when the light plane returning General Kim, commander of the ROK I Corps, to Kangnung crashed in the Taebaeks, killing the general and his pilot. General Paik, the excellent leader of the ROK 1st Division, became the new commander of the ROK I Corps early in April and Brig. Gen. Kang Moon Bong took command of the 1st Division. 51 Rad, GX-3-5348 KGOP, CG Eighth Army to CG I Corps et al., 29 Mar 51; Ridgway, The Korean War, pp. 120-21; Eighth Army PIR 254, 23 Mar 51, and PIR 259, 28 Mar 51. 52 Rad, GX-3-5348 KGOP, CG Eighth Army to CG I Corps et al., 29 Mar 51; Eighth Army G3 Jul, Sum, Apr 51. 53 Rad, GX-3-5348 KGOP, CG Eighth Army to CG I Gores et al., 29 Mar 51; Eighth Army G3 Jnl, Sum, 29 Mar 51. 54 Rad, GX-4-805 KGOP, CG Eighth Army to CG I Corps et al., 3 Apr 51. 55 Eighth Army G3 Jul, Sum, 2 and 3 Apr 51; Rad, GX-4-979 KGOO, CG Eighth Army to C/S ROKA et al., 4 Apr 51; Eighth Army CG SS Rpt, Apr 51; MS, Ridgway, The Korean War, Issues and Policies, pp. 419-20; Ridgway, The Korean War, p. 121; Rad, C 59397, CINCFE to DA, 5 Apr 51.